*SALE MAKE* Bling your handbag by making a sparkly keyring with Swarovski and beads from the Spring Clearance! Take two triangle beads and two gemstone beads, put each bead onto an eye pin and create a wrapped loop. Connect the beads together, alternating between gemstones and triangle beads with jump rings in between. Thread a gemstone, then the cougar bead, and another gemstone onto a head pin and turn a loop. Attach this to the bottom of the chain you just made. Connect the top of the chain to the keyring clasp. 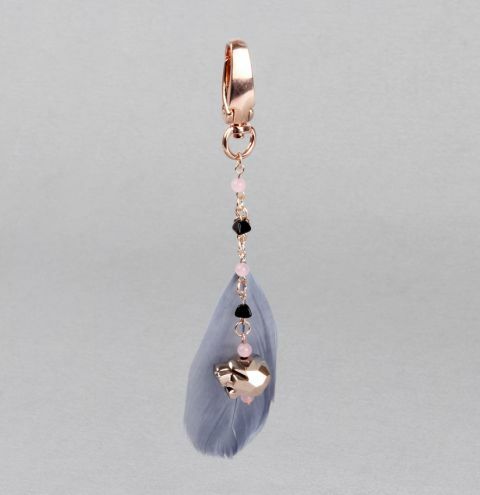 Connect a couple of jumprings together and attach them to the feather charm, and half way down the beaded chain.